Ho-ho-ho, it’s the holiday season. Christmas is the most wonderful time of the year, and shopping has begun in full fervor. One of the most magical places to shop during the holiday season is Hallmark. Walking into one of their enchanting stores will immediately put you in a jolly mood; the ambience is so festive. They carry a diverse selection of unique and signature gift ideas that you typically cannot find anywhere else. I always find some whimsical and wonderful gifts for friends and family each year. Now several of their items can be found exclusively in Walmart, making holiday shopping so much easier. Here are some items you can find in Hallmark this holiday season. Hallmark is celebrating their adorable snowmen with a 15th-anniversary ornament. 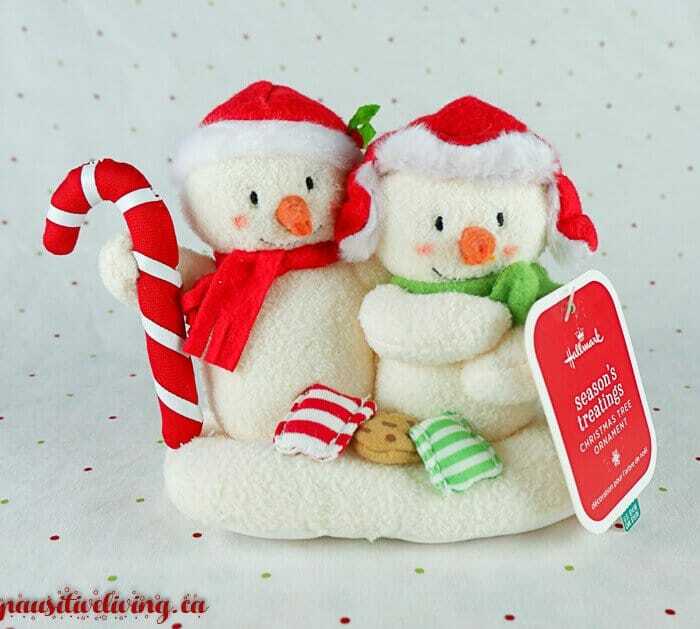 This whimsical pair will add a frosty flair to your Christmas tree. They’re soft, cute and retail for $19.95. 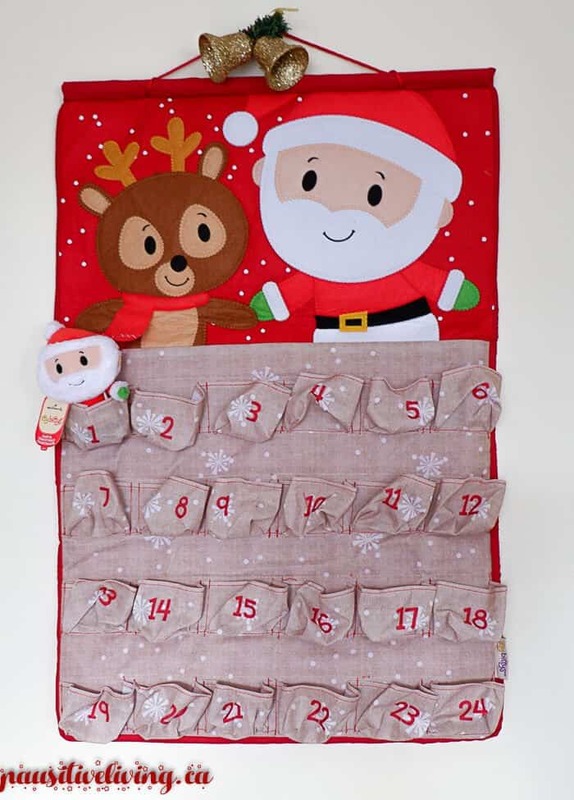 We’ve never had a Christmas countdown calendar, so we are delighted with the new itty bitty Santa Christmas Countdown Calendar. Santa and Rudolph will help you count down the days to Christmas with 24 little pockets that are ideal for other itty bitty plush characters, starting with itty bitty Santa. The top fabric is felt and the bottom part has a sturdy burlap texture. Kids will have fun filling the pockets with special holiday items as they draw closer to Christmas. Retails for $39.95. Send out some holiday cheer from the beloved Peanuts character Woodstock. He’s decked his house out to resemble a gingerbread house, including candy, sparkles and frosty snow. Inside you’ll find 16 bedazzling Woodstock Christmas cards with a festive message. Retails for $16.99. 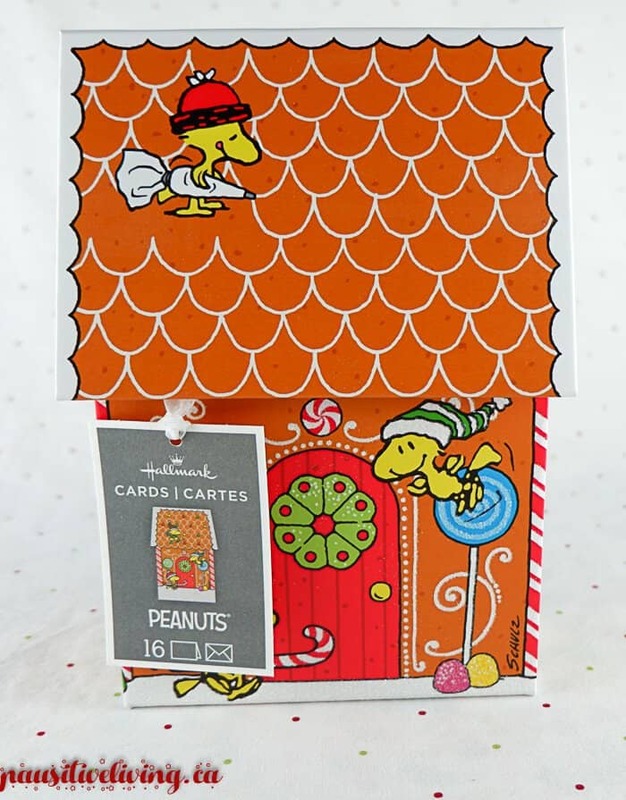 They also have a huge variety of cheerful and musical Christmas cards that will lift a lot of spirits ranging from $5.49 – 10.99 for single cards, and $16.99 – 19.99 for boxed sets. The Paper Wonder cards can only be found exclusively in Walmart. These gorgeous 3D cards add a whole new meaning to the Christmas card. They feature delicate laser cuts and dimensional layers in a variety of different playable holiday scenes. You’ll get a different perspective from 3 different sides. They’re absolutely stunning and retail for $8.99. 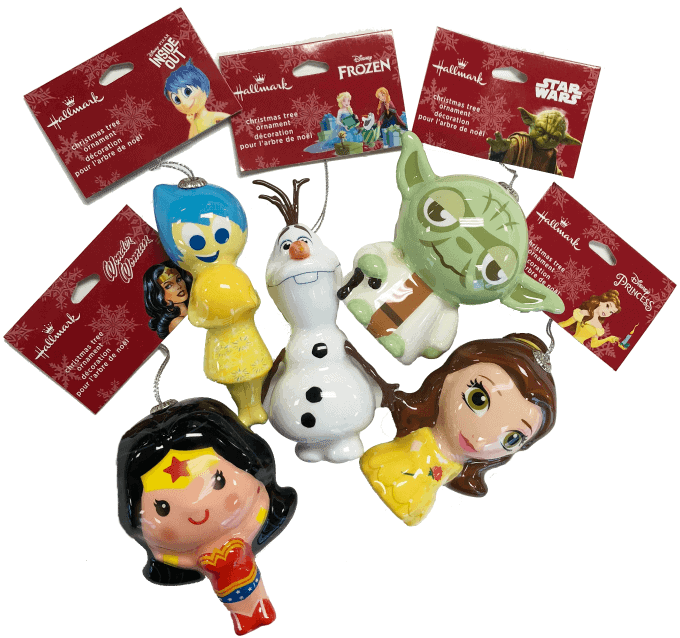 Add some flair to your tree with some Disney Princess, Star Wars, Wonder Woman and Inside Out Decoupage Ornaments found exclusively at Walmart. Choose from a variety of characters from your favorite show. Each figure is made from decoupaged plastic so they’ll last for years to come. Retails for $8.48 each. 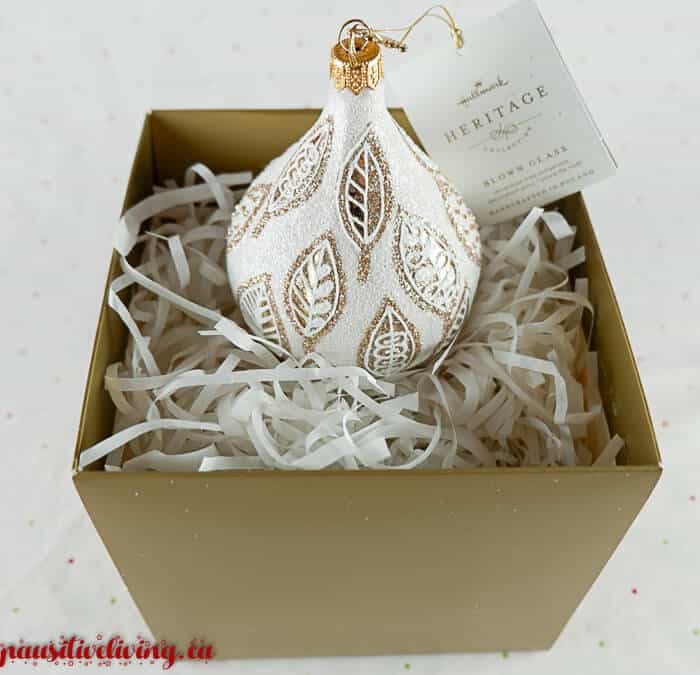 From the Hallmark Heritage Collection, you can pick up one of their elegant ornaments like the Leaf Pattern Teardrop ornament. Made from blown glass, it glistens and reflects your Christmas tree lights. This delicate bauble is sure to be a treasured keepsake you bring out every year. Retails for $24.99. 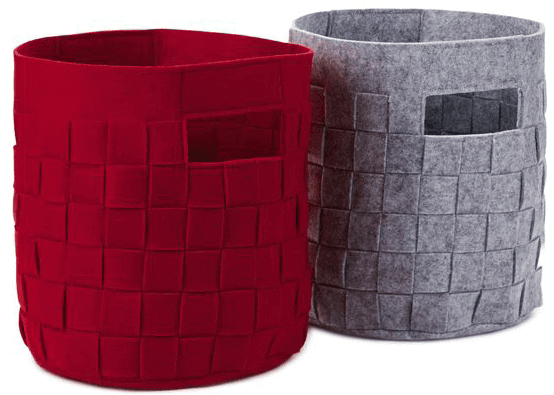 Hallmark has some attractive multifunctional Felt Totes this holiday season. The woven felt is thick, soft and durable and has easy to grip handles for carrying. Perfect for the knitter in your family to store yarn and craft project, or maybe storage for lots of little toys. It comes in red or grey and retails for $24.99. 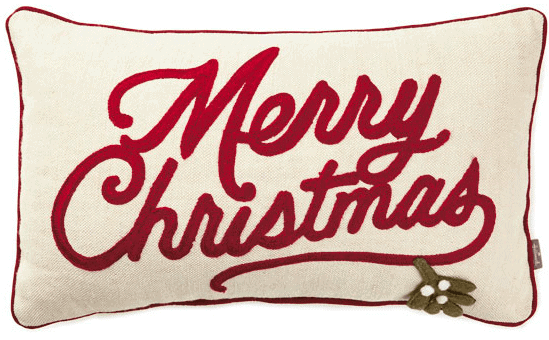 Cheer up your living room, guest bedroom or entryway with this festive Merry Christmas pillow. Made from linen and embellished with an embroidered classic holiday greeting and felted mistletoe. Trimmed with red piping, it’s the perfect companion to the Herringbone Throw. Retails for $32.99. Hallmark has a nice selection of ceramic options for holiday gifts. Give mom a two-toned snowflake mug to enjoy her coffee or hot chocolate, retails for $ 15.99. For those who celebrate Hanukkah, give the gift of bowls with the Star of David print, retails for $14.99. Hallmark didn’t forget kids and people who love collectibles. This new version of the Memory Game has 24 chipboard game pieces (12 pairs) with holiday-themed pictures on them. It’s a perfect stocking stuffer and retails for $16.99. Secret code: holly jolly. Classic Cars are a favorite among guys, and the 1957 Chevrolet Bel Air is sure to bring back some memories. Each year Hallmark will feature a different classic car from this series, so be sure to collect them all. Retails for $12.99. Deck your festive gifts in decorative tissue paper. Choose from a variety of holiday-inspired colors and prints that can be coordinated with matching gift bags. They even have scratch and smell candy-cane print tissue that has the scent of peppermint. Tissue paper retails from $1.99 – $2.49. Cheerful and festive ribbon adds a special touch to Christmas gifts. The From Santa roll offers 5.48 meters gift wrapping ribbon. Retails for $4.99. No gift is complete without a bright shiny red bow. The Signature Red Metallic Pull Bow will flair and a pop of color to all your gift packages. Retails for $8.99. The gift bags at Hallmark are so decorative and feature many different festive prints, patterns and designs. They’re a gift in themselves and perfect for all kinds of holiday presents. They come in a multitude of sizes and retails from $3.99 – 7.99. Hallmark has everything you need to make this Christmas a special one. Swing by and check out all their holiday gift ideas, cards, and bags. There is something for everyone. love to win to add to my Christmas Stuffie collection! The Santa is so cute! Every year we buy a new stuffie, usually with the year embroidered on it! I would love this prize to put the Christmas spirit in our RV where we live full-time. I would love to win because I have many nieces and nephews that will have fun playing with it when visiting their favourite aunt. I love adding new holiday noise making toys to my collection each year. Plus my kids would love him just as much I bet! I would love to win this to add it to my Christmas decorations. I have a large walking Santa and a singing Mrs. Claus, this would add to my collection. I would like to win this to gift to my Grampa-he loves this sort of thing. I love Christmas decorations. This would be a nice addition to my collection. This would be a great way to mark my grandson’s first Christmas. I would love this because it is so Christmasy! Who doesn’t want a interactive plush Santa to include in their holiday decor?! It is from Hallmark thus I am sure it is a quality item. I would like to win this plush Santa for my grandchildren! need some cheer this holiday season sister has late stage cancer,mother heart failure,younger sister having open heart surgery any day. I have been trying to add to my Christmas decor, so this would be great. I like that he talks as well. I’d love to win this to sit out in my living room! I would love to win because I collect stuffed Santas like this one. I would love this, he would fit in perfect with all my other Santas, plus he is a Hallmark Santa which makes him even more special!! My nephew would love this for xmas! I want to win this prize for my little one, he likes holidays, especially Santa! I like to win this to add to our Christmas decor because I think it is cute and fun. We lost most of our Christmas stuff last year and I think the kids would really love this. We used to have a rock n roll dancing Santa and I think my kids would like this Santa just as much. I would love to win this Santa. I love Christmas so much. I wish it could be year round. And I live in a nursing home so this Santa would be a great touch & it is not to big. Thank you for this great contest. I am a big hallmark and cute factor fan. I actually have not seen these in the store and would love to add them to my christmas collection. I would love to win this because we could use a little more holiday here in our home. 🙂 thanks! Id love to win as it would be a nice addition to our decor! My son and his wife just bought their first home and these would be wonderful for them to start their decorations for Christmas. I am still a kid at heart…would be so cool to win this prize, please !! I want to win this prize to give to my daughter. This is adorable! The kids would love it! This is so sweet. Would love it. 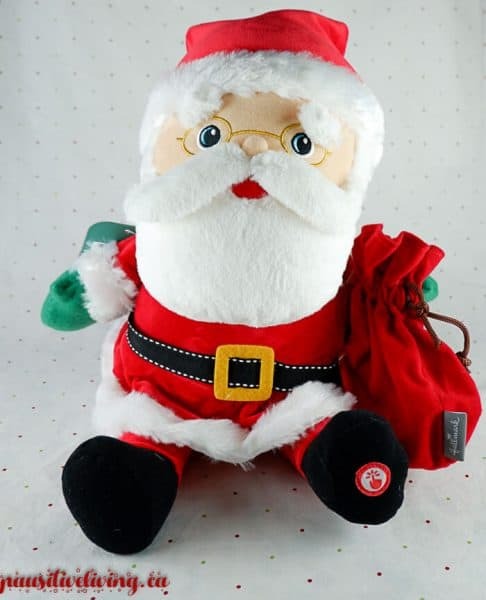 I would love to win this super cute Santa for my grandson, he would LOVE it too! I would love to win this cute Santa and give it to my Mom. She has so many Christmas stuffies and would love to add this guy to her collection. i want ot win this prize so i can share it with my friends. one gf loves snowmen and im sure she would love to get them. I’d love to win because I love Hallmark products and this would be a lot of fun. I’d love to win this to sit in a little rocking chair in my living room! So cute ! I would love to win because it is so cute and would add to our Christmas decorations! I’d love to win this for my Santa collection. Wow! What awesome prizes to be won! I would like to win this because I think my granddaughter would love it. It would be a great addition to our Christmas collection. I’d love to win this, because I love Hallmark products! A great addition to my Christmas collection. I would love to win this to use in decorating our house, my school age son would love it! Because they are so cute! And my Xmas decor is very barren right now! I love Hallmark products–excellent quality! I want to win this to give to my daughter, who moved out last year, needs more Christmas decor and would be delighted to receive this! I would like to win this for my granddaughter who collects bears. She would love this! Love to win this to gift to a sweet little girl! My kids love plush things that make noise. A new addition to the house would make their Christmas even more awesome. I’d love to get my godson a musical plush to play with Christmas morning. The Christmas prizes are great. I’d like the Santa or maybe a Advent Calendar. Hallmark items would be perfect gifts! My granddaughter would absolutely love Santa. I would love to win this prize to add to my Christmas collection. I would love to win so our home could have some added holiday spirit! I would love to win this prize to spruce up my Holiday Decorations. I havent spent money on the decorations for many years now. like you say, there is something for everyone….so it would be so great to win this! Santa is so cute and I love Hallmark products. My daughter would love this cute Santa and it would be fun to listen to the Christmas phrases! I would like to win this prize as I know my little granddaughter would love it. This would be so fun for my boys! THis has some really nice gifts to share. I love to win this because it is fun. Who doesn’t love christmad decor! Would love to add some new Christmas decor to the collection. Some of my decor has seen better days. I want to win it because my Mom loved Santa Claus & this would remind me of her & how jolly she was at Christmas. Love this! I have a grandson who would really love it! The items are cute and adorable. I want to win just because it is Christmas. I’d love to win this for my granddaughter she would love to have this Santa. I want to win this because my nephew will be old enough to enjoy it next year. These are adorable. My granddaughters would enjoy these.